On any given night in California, there are about 134,278 people without a home. California, with 12 percent of the U.S. population, has 25 percent of the nation’s homeless people. California’s homeless population increased 13.7 percent between 2016 and 2017. About 36 percent of the homeless population are families with children. About 25 percent of the homeless population have jobs. Homelessness increased 20 percent in San Francisco, and grew 14 percent in Los Angeles, but decreased 13 percent nationally, from 2009 to 2016. 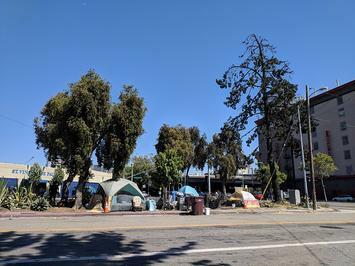 Four of the top ten U.S. cities with the largest homeless populations are in California: Los Angeles, San Diego, San Jose/Santa Clara, and San Francisco. The major cause of homelessness in these cities is the lack of affordable housing – as housing costs increase faster than incomes. West Coast cities tend to lack right-to-shelter laws, and therefore are not required to provide beds for homeless people. Instead, these cities have homeless tent encampments. For example, 25 percent of Los Angeles City/County’s 55,188 homeless people were unsheltered in 2017. In contrast, only 5 percent of New York City’s 76,501 homeless people were unsheltered. Unsheltered homelessness increased 48 percent in San Francisco, and grew 35 percent in Los Angeles, but decreased 23 percent nationally, from 2009 to 2016. In California, 68 percent of the homeless population was unsheltered in 2017. California accounted for 49 percent of all unsheltered people in the U.S. The primary cause of homelessness is the lack of affordable housing, according to city officials surveyed by the U.S. Conference of Mayors. A home is deemed affordable if rent or house payments are 30 percent or less of a household’s gross income. Only 26 percent of California households earning the statewide median income could afford to buy the median-priced single-family home in the state, in the second quarter of 2018, a 10-year low, and down from 29 percent a year earlier. In the San Francisco Bay Area – 18 percent could afford the median-priced home, and in the Los Angeles Metro Area – 29 percent. The national average was 53 percent. Overall, California homeowners spent an average of 21.9 percent of their household income on housing costs, the 49th worst in the nation in 2016, while renters spent 32.8 percent, the 48th worst. Housing affordability is decreasing. For example, families in the Inland Empire with a median income of $61,200 needed to allocate 22.7 percent to pay for principal, interest, and taxes on a median-priced, $293,2000 home in 2016, compared to 12.7 percent in 2009. There is a direct relationship between the reduced availability of low-cost housing and the increased number of homeless people. The lack of affordable homes to buy increases the demand for rental units, which raises rents, and forces more people at the lowest economic level into homelessness. Extremely low-income renters increasingly face unaffordable housing costs, overcrowding, squalor, and homelessness. “Our results suggest that simple economic principles governing the availability and pricing of housing and the growth in demand for the lowest quality housing explain a large portion of the variation in homelessness among US metropolitan housing markets. Furthermore, rather modest improvements in the affordability of rental housing or its availability can substantially reduce the incidence of homelessness in the US…Homelessness can be reduced by attention to the better functioning of housing markets,” wrote University of California, Berkeley professors John M. Quigley and Steven Raphael in a 2001 report. Southern California has become one of the top areas in the nation for homelessness, as expensive housing and unaffordable rent have driven many people into shelters and onto the streets. In Los Angeles, 61 percent of the population were renters in 2016. From 2011 to 2017, the median rent for a one-bedroom apartment in Los Angeles County increased 67 percent, from $1,200 to $2,000, while average incomes stagnated, and the homeless population grew 75 percent. A rent hike of 5 percent boosts the number of homeless people by 2,000 in Los Angeles, according to Zillow. Fifty-four percent of California renters spent more than 30 percent of their income on rent in 2016. Paying more than 30 percent of income on housing can make it hard to afford basics like food, clothing, transportation, and health care. Twenty-nine percent of California renters spent more than 50 percent of their income on rent in 2016. Rent payments of over 50 percent of income represent a severe housing cost burden. Severe-housing-cost-burdened renter households increased 30 percent in California, compared to a 21 percent increase nationally, from 2007 to 2016. Factoring in housing costs, California’s poverty rate is the highest in the nation. Persons living in poverty are most at risk of becoming homeless. California is at full employment, increasing the demand for housing. The share of households renting in California’s eight largest cities rose from 52 percent in 2006 to 57 percent in 2016, as homeowners went back into the rental market as a result of the subprime-mortgage crisis. In the gentrification of neighborhoods, high-end, higher-cost housing replaces deteriorated, affordable housing. Property values and rents in the neighborhood increase. The neighborhood’s low-income residents, who cannot afford higher-cost housing, are displaced by higher-income residents (gentry). The process of gentrification reduces the supply of affordable housing. A 1983 study of five cities (Boston, Cincinnati, Richmond, Seattle, and Denver) found that 23 percent of residents in gentrifying urban neighborhoods were displaced due to eviction, increased rent, or the sale of the house they were renting, from 1978 to 1980. Nationally, there has been a failure to replace single-room occupancy (SRO) housing lost to conversion, gentrification, and urban renewal. From 1970 to 1985, 1 million SRO units – half the national total – were lost to conversion or demolition. As a result of California’s Progressive land use policies, homebuilding cannot keep up with demand, creating a shortage of homes, which drives prices and rents higher, to the point of being unaffordable, thereby increasing homelessness. California’s development approval processes have become burdensome, causing the number of new housing units built to lag behind the state’s population growth. California ranks last in the nation in home construction on a per capita basis. For every 2.8 California jobs created in 2018, only one new housing unit is being constructed. Zoning restrictions, along with opposition by NIMBYs and environmental activists, hinder housing development. “Considerable evidence suggests that construction of market-rate housing reduces housing costs for low-income households,” writes the California Legislative Analyst’s Office. The solution to California’s homeless crisis is to build more homes and apartments. The solution to affordable housing is to encourage additional private, market-rate housing construction. Housing vouchers and Housing First programs are effective, but only if there are homes available. In order to build more homes, California needs to reduce its over-regulation, to make it easier to build. For example: speed up the permitting process by streamlining development reviews. Reduce mandates and related construction costs. Ensure that a sufficient supply of land is zoned to meet a community’s housing needs, including single-family homes, condominiums, townhomes, and apartments. Development impact fees, the costs of which are passed along to homebuyers, must pay only for the actual costs of providing services and infrastructure for the project. Californians need to make it a priority for people – rich or poor – to have a home. Bruce Colbert, AICP is executive director at Property Owners Association of Riverside County. He can be contacted at (949) 689-4480 or bcolbert@poarc.com.